This playground honors Andre Ampere (1775-1836), an accomplished French physicist and mathematician who is considered the father of electromagnetic theory. Ampere Avenue, located near Radio Drive and Ohm Avenue in the Bronx, is also named for Andre Ampere. The streets were given electric names after Issac Leopold Rice, president of the Electric Storage Battery Company, donated the land near Ampere Avenue to the City. Born in Lyon, France on January 20, 1775, Andre Ampere received no formal education. Instead, he learned from his father and by memorizing passages from the encyclopedia. By the time he was 13, Ampere had submitted a paper to the Acadmie de Lyon on the construction of a line that is equal to a specified arclength along a circle. However, due to his isolated education, Ampere was uninformed of current advances in mathematics, and his papers were deemed unworthy of publication. Ampere realized that if he was going to continue any serious work he would first have to learn calculus, then a relatively new branch of mathematics. Ampere began his first serious study of calculus after reading Joseph Louis Legrange’s Macanique Analytique (1788). However, Ampere’s studies were halted after his father was killed during the French Revolution in 1792, and he did not continue until after he married in 1799. After taking a position as a math and chemistry professor at Bourg Ecole Centrale, Ampere published a work on probability, The Mathematical Theory of Games in 1803. After leaving his professorship, Ampere earned a post at the Ecole Polytechnique in 1809, where he would stay until 1828. At the Ecole, Ampere collaborated with the mathematician Augustin Louis Cauchy in the mathematical field of Analysis and Mechanics, a branch of Physics. He developed a system of classification for partial differential equations, a complex calculus-based type of mathematical equation, and the accomplishment was a major factor in Ampere’s defeat of Cauchy in an election to the Instit National des Sciences in 1814. Ampere was appointed to a chair at the Universite de France in 1826 and retained the position until his death. In addition to his work in mathematics, Ampere made important contributions to chemistry and physics. In 1811 Ampere postulated that an unknown acid found two years earlier was in fact a new element similar to hydrogen that he named fluorine. Ampere, however, is most noted for his work on a combined theory of electricity and magnetism based on the earlier experiments of the Danish physicist Hans Christian Orsted, who discovered that a needle placed in a magnetic field obeyed previously established laws for electric force. In an incredible three-month period after the release of Orsted’s work, Ampere published his own theory of the forces and symmetries involved in electromagnetism. In his 1926 Memoir on the Mathematical Theory of Electrodynamic Phenomena, Ampere presented a mathematical derivation of a combined electromagnetic force. The paper presented what later became known as Ampere’s Law, which describes the magnetic field produced by a conductor carrying a current. Ampere is also credited with the invention of the solenoid, a tightly wound cylinder of wire with particular electromagnetic properties. In addition, Ampere further unified his theory of a combined electromagnetic force by the discovery that two wires carrying current in opposite directions repel and those carrying current in the same direction attract in a manner similar to the opposite poles of magnets. In honor of his work, the unit of electrical current, equal to one coulomb of charge per second, was named the Amp in honor of Andre Ampere. The City acquired this property on October 22, 1927 by condemnation and a playground was opened on the site on June 5, 1958. The park’s name was originally P.S. 64 Playground before Commissioner Stern changed the name to Ampere Playground in 1985. 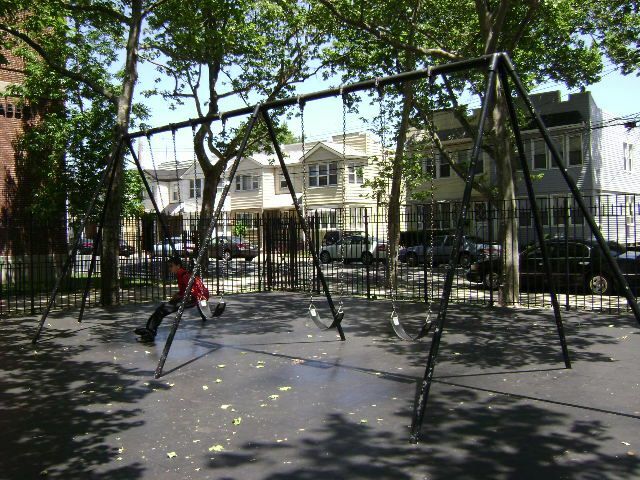 Ampere Playground was then the 733rd playground in the City and has been jointly operated by Parks and the Board of Education since March 1955. The park features a comfort station, benches, game tables, play equipment, and a spray shower. 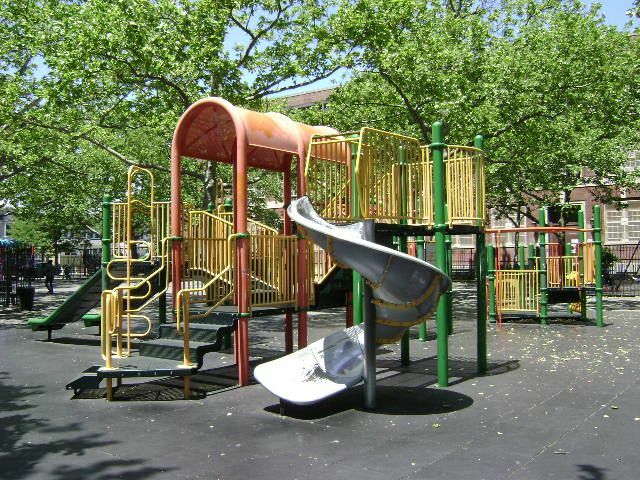 Parks maintains the playground with significant help from the surrounding community, which comes together for annual volunteer days organized through the Queens Community Board 9.